Which social network is your favorite, Twitter, Facebook, Google+, or all of them? No matter which one you like, we believe the social network inspired pixel coaster set should be able to catch your eyes. 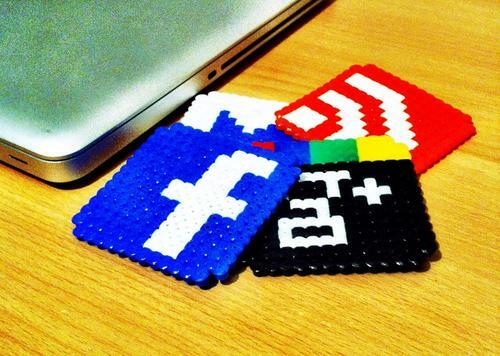 This is a set of handmade coasters inspired by the popular social networks, including Facebook, Twitter, Google+. The coaster set contains 4 beautiful coasters in total. Each coaster is shaped as the familiar icon of the social networks, also including a RSS feed icon, and as we can see from the images, the coaster features nice details and retro 8-bit style in order to show your love to the social networks and pixel art. The social network inspired pixel coaster set is priced at $15 USD. If you’re interested, jump to Etsy for more details. Additionally, if you need more options, you might like to check the Minecraft tools coaster set, the Pacman coaster set and more via “coaster set” tag.